IXperience CEO Aaron Fuchs speaks to a group of students Tuesday at Parkes Hall. During the event, Fuchs shared life and career advice he learned through founding his startup. The CEO of an education company shared career advice he learned from starting his own business, drawing on his journey from rural South Africa to Wall Street. 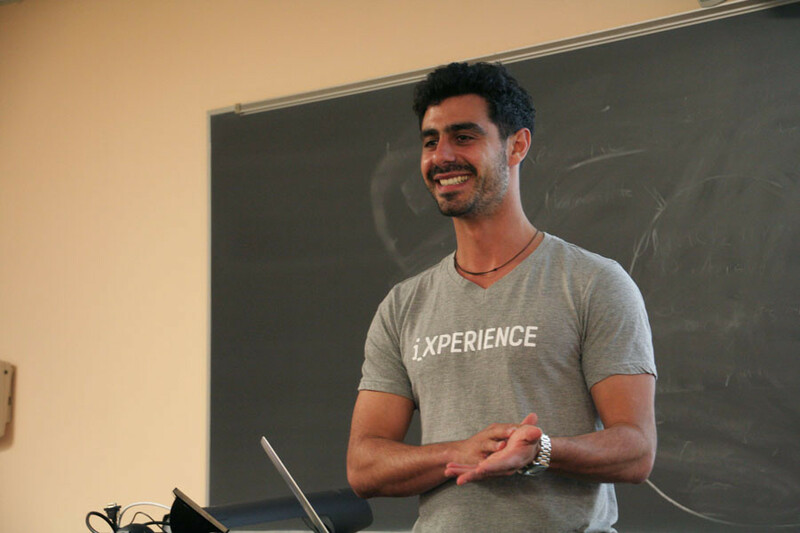 Aaron Fuchs told a group of more than 15 students in an hour-long presentation at Parkes Hall how he came to found a startup. The event was hosted by NU’s chapter of TAMID, an organization that seeks to connect college students with the Israeli economy through education, investment funds and access to summer internships. Fuchs offered both career and life advice during the talk, discussing how passion should fit into students’ careers. Fuchs is the CEO of the South Africa-based iXperience, a company that runs a career training program for American students in Cape Town. Fuchs was born in rural South Africa and did not have much access to technology before his family moved to Cape Town when he was 10. He graduated from Yale University and worked on Wall Street before deciding to move back to South Africa to work at technology startup Prodigy Finance. Soon after, he started iXperience while working at a Cape Town beach. “There was really spotty mobile wifi,” he said about the location. Fuchs said the goal of his company is to completely reimagine the way we learn. The company hosts American students from top-tier colleges in Cape Town during the summer for a month-long learning experience and a subsequent internship of the same length, he said. During the program’s first summer, only one course in coding was offered to 40 students. Next summer, between 250 and 300 students will have access to six courses. “The popularity of the program is exploding,” he said in an interview after his presentation. Fuchs said he was encouraged by Yale career services to get into finance or consulting after college, but he did not enjoy his time on Wall Street working at a hedge fund, and chose to return to his home country to pursue his passions in technology and education. The CEO is presenting at 20 universities across the country, including Harvard, Stanford and the University of Chicago. Fuchs also said to dream big and to create a network of friends and mentors to use for inspiration. He shared career advice and said to focus solely on the task at hand, use both the right side of the brain as well as the left side and pursue personal goals. Weinberg freshman Ellen Wu said she found Fuchs’ talk inspiring. “I really enjoyed hearing his story,” she said. “I always like hearing new advice and having a different perspective from someone who has been successful and tried something new.